(Nanowerk Spotlight) Various nanotechnologies are being researched for applications in water treatment because the removal of bacteria and other organisms from water is an extremely important process, not only for drinking and sanitation but also industrially as biofouling is a commonplace and serious problem. In what could be developed as a a cheap point-of-use water filter for deactivating pathogens in water, or as a new component to be integrated into existing filtration systems to kill microorganisms which cause biofouling in downstream filters, researchers have now demonstrated a textile based device for the high speed electrical sterilization of water. There has been a large amount of work investigating the use of silver nanoparticles for antibacterial treatment of a variety of substrates, including cloth and medical devices. Combining this with recent advances in fabricating three-dimensional nanostructures, Yi Cui, an assistant professor in materials science and engineering, and his collaborators at Stanford University have now demonstrated an exciting new strategy for taking advantage of silver nanowires' and carbon nanotubes' unique ability to form complex multiscale coatings on cotton to produce an electrically conducting and high surface area device for the active, high-throughput inactivation of bacteria in water. "Our chief insight over previous work is that using silver nanowires, instead of nanoparticles, allows the silver to be placed at an electrical voltage" Cui explains to Nanowerk. "As it turns out, this dramatically improves the antibacterial effect of the silver, allowing for the high speed operation necessary to enable the water sterilization device." Reporting their findings in the August 20, 2010, online issue of Nano Letters ("High Speed Water Sterilization Using One-Dimensional Nanostructures"), the team describes a simple technique for the preparations of a complex three-dimensional device that can quickly kill bacteria in water using small amounts of electricity. They accomplished this by dying regular cotton cloth with ink containing two different nanomaterials – silver nanowires and carbon nanotubes (CNTs). This is in contrast to existing filters which remove bacteria from water by forcing it through small pores, which can ultimately clog and subsequently require a replacement of the filter. The structure of the novel material consists of three different fiber components spanning three length scales and each providing a different functionality. "The backbone of our material, cotton, was chosen since it is cheap, widely available, and chemically and mechanically robust" explains Cui. 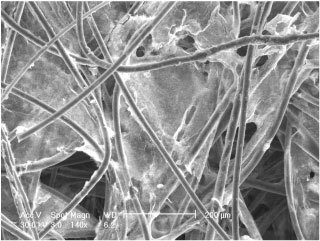 "These considerations are extremely important for making filters of practical importance and are a challenge for many other technologies, including electrospun nanofibrous filters.10 The pores between fibers in cotton are in the range of tens to hundreds of micrometers, much larger than the length scale of bacteria, which prevents the device from mechanically clogging during use." The second component are silver nanowires with diameters between 40 and 100 nm and up to 10 µm in length. Apart from their bactericidal properties, these nanowires can form an efficient electrical transport network in filters since they reduce significantly the number of electron hopping times as compared to nanoparticles. According to Cui, this is an important advantage: "Noble metal electrodes are known to exhibit antibacterial action under moderate currents, and the enhancement of a sheet of silver nanorods' antibacterial action when placed in an electric field has recently been observed. 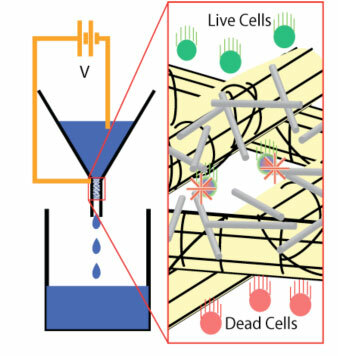 Due to the interconnected nature of the silver nanowire coating, we can take advantage of this phenomenon for very effective bacterial inactivation." The final component are carbon nanotubes. They are included as a means to provide conformal conductive coatings to ensure good electrical conductivity over the entire active area of the device so it can be placed at a controlled electric potential and used in solution as a porous electrode. The team tested their filtration device by operating it at five separate biases from -20 to +20 V and by comparing silver nanowire/CNT cotton with CNT coated cotton only. At zero potential, neither filter effectively removes bacteria. However, at -20 V the silver nanowire/CNT cotton inactivates 89% of the bacteria, while at +20 V it inactivates 77%. "The CNT-only cotton shows much less activity at all voltages tested, indicating the importance of the silver nanowires for effective bacterial inactivation" says Cui. "And while bacterial inactivation at 80-90% may not be enough for most applications, our device shows similar performance over a wide range of bacteria concentrations. Three stage serial application of this process may be used to effectively reach inactivation efficiencies of more than 98%." He cautions that this is early work, and the device needs to be scaled to larger sizes in order to process reasonable volumes of water. Future work will also be necessary to assess how well the cloth retains the nanomaterials. "If necessary the process will be engineered to avoid any release of nanomaterials into the processed water" Cui says. The researchers believe it is possible that with further optimization this device could be used for point of use water treatment in areas without access to chlorine treated water. Another exciting opportunity could be the use of this filter to fight biofouling, which is a very common problem that affects any industry or process using water filtration. In typical water filters, bacteria can slowly accumulate until they reach a critical mass, when they will form a plaque. This biofilm is nearly impossible to remove, requiring the replacement of the filter. "Our device could serve as a module for upstream treatment of the water to protect more expensive filters downstream" says Cui. "This could be particularly useful in the reverse osmosis process used in desalinization, which relies on expensive, delicate membranes to separate the salt from the water." He points out that this is just one example of a growing trend: the application of nanomaterials to less high-tech and more traditional engineering problems. "A real challenge going forward is going to be identifying areas where nanomaterials can offer real advantages over existing technology, and it's a real opportunity for nanoscientists to broaden their horizons beyond the problems and technologies addressed in the early days of the field."